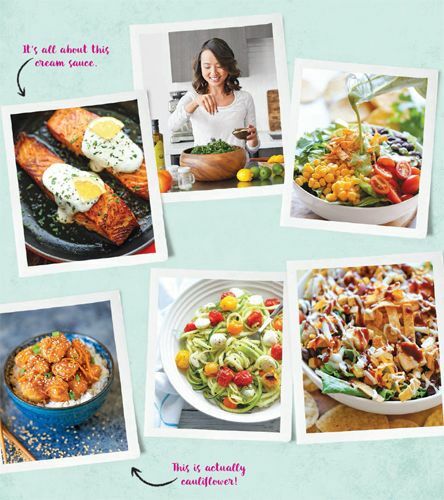 Quick, healthy, and delicious. What more can you ask for? 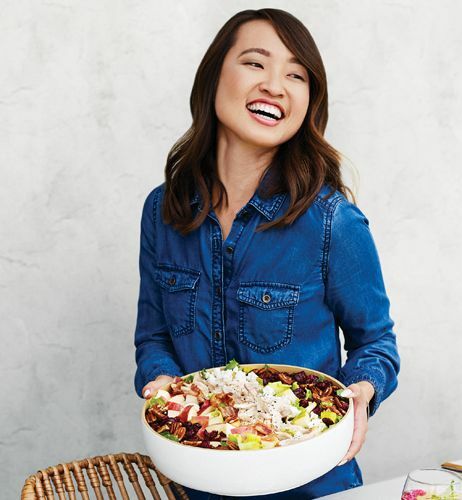 Being busy doesn’t have to mean junk food binges when you have these easy, satisfying recipes in your weekday rotation. BBQ chicken salad is one of my favorite salads to order while eating out, but it can get expensive. I like to think my spin on this salad can stand up to any restaurant dish, except you can make this much cheaper at home. I whip this up as my go-to lunch at least once a week, with extra tortilla strips on my cheat days. 1. Heat the olive oil in a medium skillet over medium-high heat. 2. Season the chicken breasts with salt and pepper to taste. Add to the skillet and cook, flipping once, until cooked through, 4 to 5 minutes per side. Let cool before cutting into bite-sized pieces. 3. To assemble the salad, put the lettuce in a large bowl; top with the chicken, tomato, corn, beans, red onion, and both cheeses. Pour the Ranch dressing and barbecue sauce on the salad, and gently toss to combine. 4. Serve immediately, garnished with the tortilla strips, if desired. This salad pairs crisp bacon with juicy apples, pears, and sweet cranberries so you get to enjoy great fall flavors all year long. And the oh-so-dreamy poppy seed dressing is made a little bit lighter with Greek yogurt instead of mayonnaise. I promise you won’t be able to tell the difference! 1. Make the poppy seed dressing: In a small bowl, whisk together the yogurt, milk, mayonnaise, sugar, apple cider vinegar, and poppy seeds; set aside. 2. Heat a large skillet over medium-high heat. Add the diced bacon and cook until brown and crispy, 6 to 8 minutes. Transfer to a paper towel–lined plate; set aside. 3. To assemble the salad, put the lettuce in a large bowl. Arrange individual rows of bacon, chicken, apple, pear, pecans, cranberries, and goat cheese on top. 4. Serve immediately with the poppy seed dressing on the side. Nothing beats homemade salad dressing, especially when all it takes is 5 minutes in the food processor. Simply pulse and you’re set. You can easily adjust the consistency of the dressing by adding more or less olive oil. 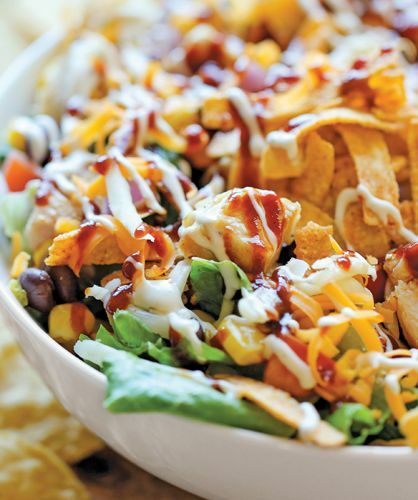 Whether you like your dressing a little thinner or thicker, you just can’t go wrong with this Tex-Mex–inspired salad. 1. Make the cilantro lime dressing: Pulse the cilantro, yogurt, garlic, lime juice, and salt in the bowl of a food processor. With the motor running, add the olive oil and vinegar in a slow stream until emulsified; set aside. 2. In a medium bowl, toss the shrimp with the Cajun seasoning and 1 tablespoon of the olive oil. Heat the remaining 1 tablespoon olive oil in a large nonstick skillet over medium-high heat; add the shrimp, and cook, stirring occasionally, until browned and cooked through, about 5 minutes. Set the pan aside to cool slightly. 3. 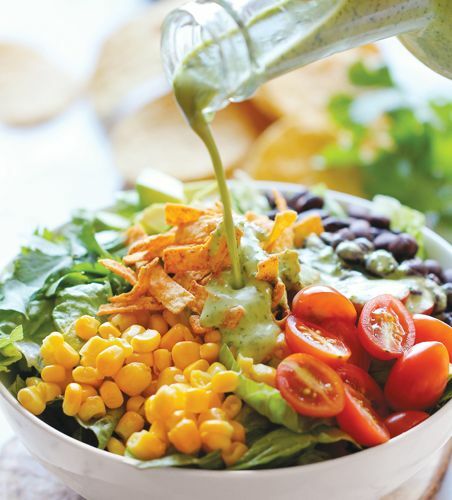 Assemble the salad: Put the lettuce in a large bowl; top with the tomatoes, corn, black beans, and cilantro. Pour the dressing on top of the salad, and gently toss to combine. Gently stir in the avocado. 4. Serve immediately, topped with the shrimp and garnished with the tortillas strips, if desired. This is my go-to salad for potlucks and dinner parties. It holds up really well, and the colors are just so vibrant. Plus, the sesame seed garnish makes it look fancy without any work! You can even add leftovers such as chicken from the night before to make this a rounded meal. 1. 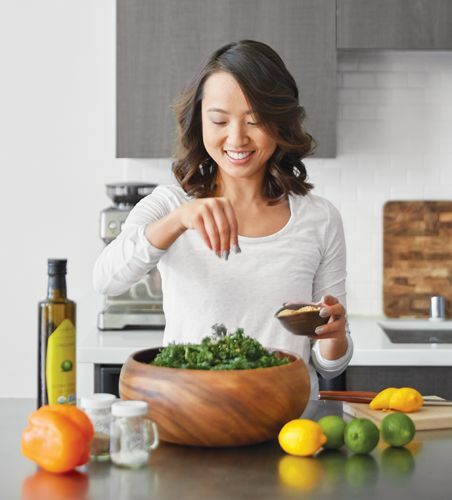 Make the vinaigrette: In a small bowl, whisk together the lemon juice, olive oil, garlic, soy sauce, sesame oil, brown sugar, and ginger; set aside. 2. Assemble the salad: Put the kale in a large bowl. Top with bell pepper, avocado, carrot, almonds, green onions, and edamame. Pour the dressing on top, and gently toss to combine. 3. Serve immediately, garnished with sesame seeds, if desired. Avocados. I love them. I’ve been known to eat one by itself with just a little sprinkle of sea salt. And now, I can eat them in this creamy pasta. This dish doesn’t use cream or butter—just simple, fresh ingredients. That’s it. 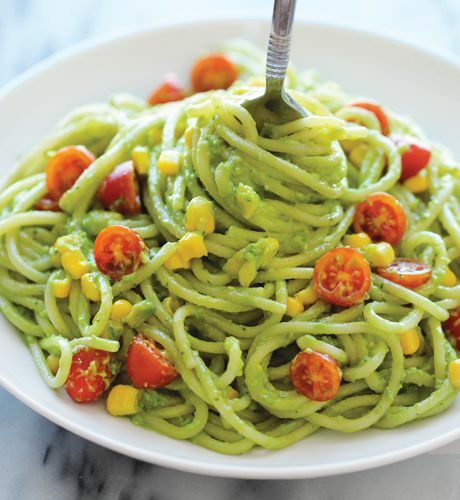 The cherry tomatoes and corn kernels add a pop of color and are another way to sneak more veggies into your diet. 1. In a large pot of boiling salted water, cook the pasta according to package instructions; drain well. 2. Make the avocado sauce: Puree the avocados, basil, garlic, and lemon juice in the bowl of a food processor; season with salt and pepper to taste. With the motor running, add the olive oil in a slow stream until emulsified; set aside. Using avocados instead of cream is a great way to exchange saturated fats for mono-unsaturated fats, which can have a positive effect on cholesterol. Here, traditional lo mein gets a complete healthy makeover with “zoodles”—ribbons of fresh zucchini instead of pasta, no boiling required! You can stir the zucchini noodles right into the sauce, cutting down the cook time to less than 15 minutes. It’s healthier and quicker. What more can you ask for? 1. Make the sauce: In a small bowl, whisk together the soy sauce, garlic, ginger, brown sugar, sesame oil, and Sriracha; set aside. 2. Using a spiral vegetable slicer, cut the zucchini into long thin strands, cutting through the strands with kitchen scissors to separate them for easier serving (see Note). 3. Heat the olive oil in a large skillet or wok over medium-high heat. Add the bell pepper, and cook, stirring frequently, until tender, 3 to 4 minutes. 4. Stir in the snap peas, carrots, zucchini noodles, and soy sauce mixture, and continue to cook until the zucchini is tender, 3 to 5 minutes. 5. Serve immediately, garnished with sesame seeds, if desired. Note: If you don’t have a spiral vegetable slicer, use a vegetable peeler to shave the zucchini into ribbons, discarding the seeds. This refreshing spiralized zucchini salad is ready in no time. For extra flavor, roast the tomatoes while you assemble the rest of your ingredients—it’s a simple step, but one that makes all the difference. You can thank me later. 1. Preheat the oven to 450°F. Lightly oil a baking sheet or coat it with nonstick spray. 2. Make the balsamic vinaigrette: In a large bowl, whisk together the vinegar, olive oil, garlic, parsley, sugar, basil, and oregano; set aside. 3. Arrange the tomatoes in a single layer on the prepared baking sheet. Add the olive oil and salt and pepper to taste. Gently toss to combine. Roast for 5 to 6 minutes, tossing once, until the tomatoes are blistered and beginning to burst; set aside. 4. Using a spiral vegetable slicer, cut the zucchini into long thin strands, cutting through the strands with kitchen scissors to separate them for easier serving (see Note). 5. 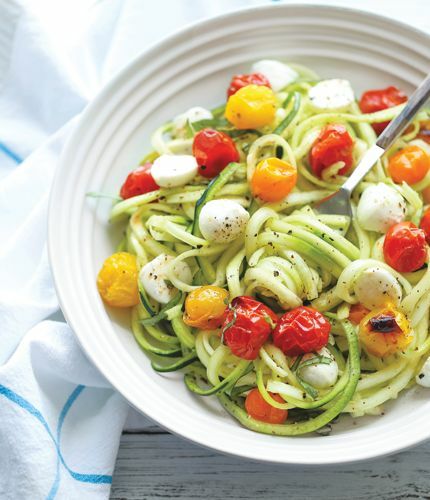 To assemble the salad, put the zucchini strands in a large bowl; top with the roasted tomatoes, mozzarella, and basil. Pour ⅓ cup of the balsamic vinaigrette on top of the salad (reserving the remaining dressing for another use), and gently toss to combine. Serve immediately. This is the perfect recipe to use up all those veggies lingering in your fridge and pantry. You can use the zucchini, carrots, corn, and bell peppers in the ingredients list below or mix it up with celery, beets, mushrooms, or black beans. Just chop or grate the quantities specified in the recipe and swap them in! Avocado would also add wonderful flavor and creaminess. When you’re ready to serve, you can use slider buns and your favorite sandwich spread; I like Ranch dressing with a dash of buffalo sauce! 1. Preheat a gas or charcoal grill, or place a grill pan over medium-high heat. 2. In a large bowl, combine the ground chicken, bell pepper, zucchini, carrot, corn, breadcrumbs, cilantro, cayenne pepper, egg, lime juice, salt, and pepper. 3. Using a wooden spoon or a fork, gently mix the ingredients until evenly incorporated. Using your hands, shape the chicken mixture into 20 (2-inch) patties. 4. 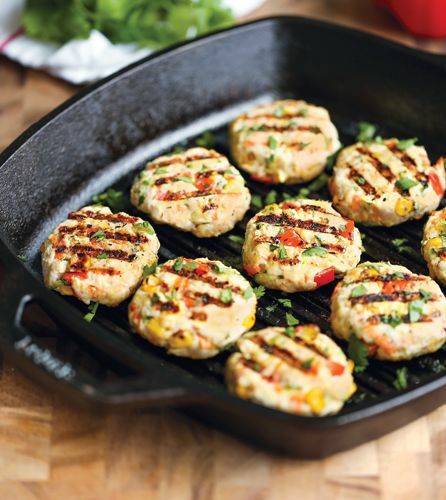 Coat the patties with a little olive oil or nonstick spray. Grill the patties until browned on the outside and cooked through, 3 to 4 minutes per side. Serve immediately. 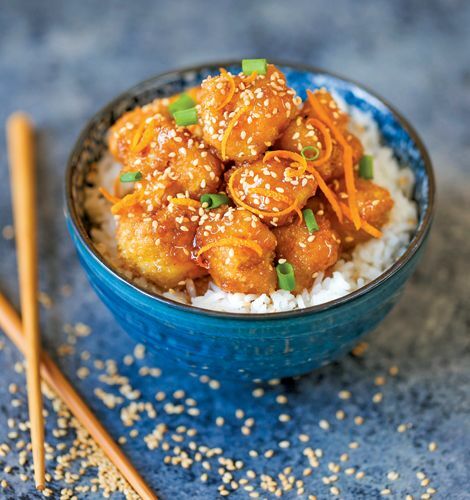 This scrumptious main dish is now the only way I’ll have the Chinese takeout favorite orange chicken—in cauliflower form, of course. It’s completely vegetarian, but don’t worry—picky eaters in your household may not even notice a difference! 1. Make the orange sauce: In a medium saucepan over medium heat, whisk together the vegetable broth, orange juice, sugar, vinegar, soy sauce, garlic, orange zest, and Sriracha. Bring to a boil, and stir in the cornstarch mixture. Cook, stirring frequently, until thickened 1 to 2 minutes; keep warm. 2. Put the cauliflower in a large bowl, and season with salt and pepper to taste. Stir in the cornstarch, and gently toss to coat the cauliflower. Working with one floret at a time, dip the cauliflower into the eggs; set aside on a baking sheet. 3. Heat the vegetable oil in a large saucepan over medium-high heat. Add the coated cauliflower, and cook until the florets are golden brown on all sides, 1 to 2 minutes. Transfer to a paper towel–lined plate; discard excess oil. 4. Serve the cauliflower immediately with the orange sauce, garnished with the sesame seeds and green onions, if desired. 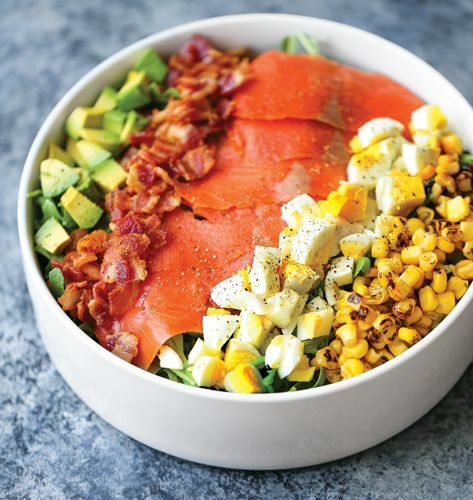 Bacon, eggs, and smoked salmon make for a killer salad bowl. And the dressing, a Greek yogurt Ranch, is out of this world at half the calories of the traditional mayo-and-sour cream version. Instead of hard-boiled eggs, you could also go with poached. 1. Make the Greek yogurt Ranch dressing: Whisk together the yogurt, buttermilk, dill, garlic powder, and onion powder in a small bowl; season with salt and pepper to taste. Set aside. 2. Heat a large skillet over medium-high heat. Add the bacon, and cook until brown and crispy, 6 to 8 minutes. Transfer to a paper towel–lined plate; set aside. 3. To assemble the salad, put the arugula in a large bowl; arrange individual rows of the bacon, eggs, salmon, avocado, and corn. Serve immediately with the Greek yogurt Ranch dressing. Note: To prepare hard-boiled eggs, put the eggs in a large saucepan and cover with cold water by 1 inch. Bring to a boil, and cook for 1 minute. Cover the pot with a tight-fitting lid, and remove it from the heat; set aside for 8 to 10 minutes. Drain well, and let the eggs cool before peeling and dicing. Incredibly simple and fast to prepare, this is one of those perfect weeknight dinners. The fish has a super-crisp crust while still boasting a wonderfully flaky interior. And the lemon cream sauce (lightened with Greek yogurt) is the ultimate guilt-free accompaniment. You can drizzle, spoon, or dip as desired. 2. Make the lemon cream sauce: In a small bowl, combine the yogurt, mayonnaise, lemon juice, garlic, thyme, oregano, and dill; season with salt and pepper to taste. Set aside. 3. Season the salmon with salt and pepper. 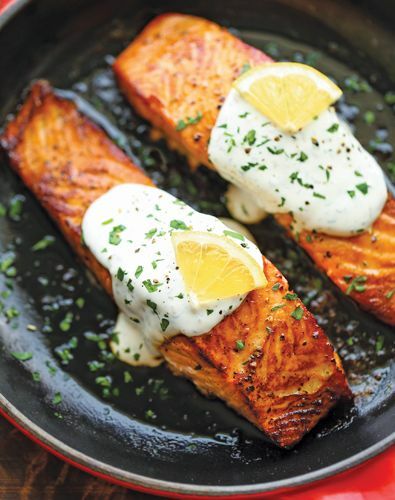 Dredge each salmon fillet in 1 tablespoon of the flour. 4. Melt the butter in a large ovenproof skillet over medium-high heat. Add the salmon to the skillet, flesh side down, and sear for 2 minutes. Turn the fillets and drizzle with the honey. Transfer the skillet to the oven, and bake the salmon until cooked through, 8 to 10 minutes (see Note). 5. Serve immediately with the lemon cream sauce. Garnish with parsley, if desired. Note: Cooking time will vary depending on the thickness of the salmon fillets.